First of all, I made a jelly from sumac and crabapples. This was pretty simple. I used 1 cup of each ingredient: crabapples, sumac berries, sugar and water. I cooked the fruit together in the water, covered, till all were soft. After straining it through a cheesecloth-lined sieve, I added the sugar and cooked until it thickened enough. With all the pectin from the crabapples, this is not a problem. Rather, be careful not to overcook it. I find the best method is to take a small sample, put it in saucer and if it thickens as it cools it is ready. Then I needed something to taste this jelly with, so I came up with this tea biscuit recipe as the first in my experiments in baking with jerusalem artichoke flour. The artichoke flour is pretty concentrated, so you don’t need much. I did not add sugar so that I could use these with sweet jams and jellies, and also with savoury. It was equally good with the jelly and with pesto (I used dandelion pesto I made last spring) with some parmesan on top. It is a light biscuit, and not as dry as many of the gluten-free ones I have tried. It was enough of a success that I have made it a few times since. Mix the egg and oil together and add to the dry ingredients. Mix just until blended. Spoon out the batter, flatten slightly, place in a baking dish and bake at 350 for 20 min. This recipe makes 6 biscuits. This recipe can be doubled. Categories: jerusalem artichoke, recipes, wild fruit | Tags: crabapples, gluten free, jerusalem artichoke, locavore, organic, recipes, sumac | Permalink. Thank you to Kazakhstan for giving us this delicious fruit. 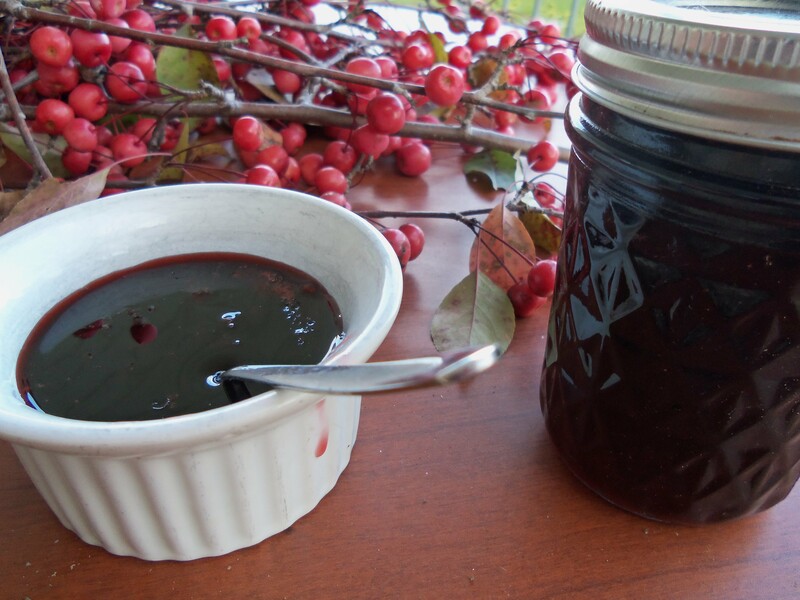 I had not used crabapples much until now – except in jelly – but have recently found so many uses for it, not sure how I managed without it. I promised over a month ago that I would report back on my crabapple liqueur, and in that time have been experimenting with the few crabapples I have been able to harvest from our own tree and few others. So this will be my wrap up on this subject for this season. Among the reasons I have enjoyed cooking with these is their flavour, colour and versatility. They are substantial, not too watery, keep well, and seem resistant to pests and fungi. Besides, they are one of the prettiest fruit trees in all seasons. The fruit does not drop easily, and many varieties hold their fruit throughout the winter, providing a feeding place for birds. No need for bird feeders with these in your garden. 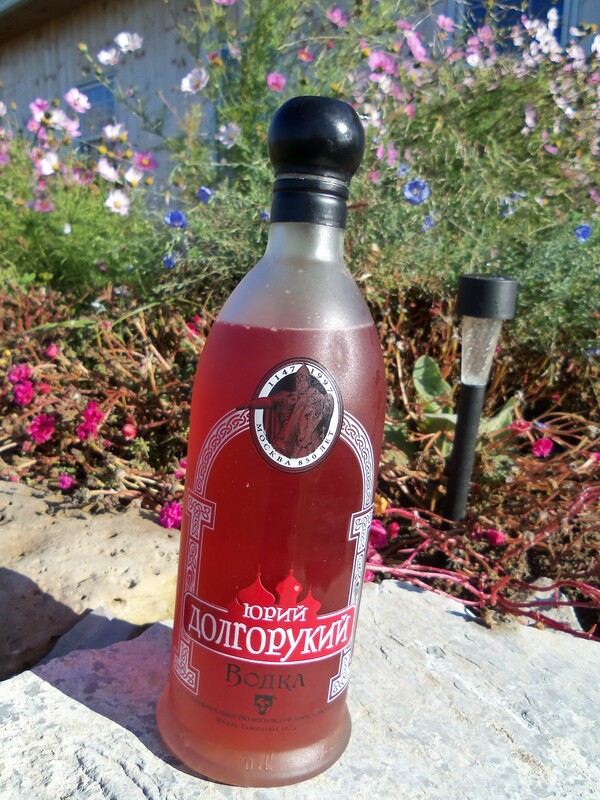 The liqueur, which was just a mixture of fresh, whole, crabapples, sugar and vodka, left to stand for a month with frequent stirrings (and tastings). I have now bottled it, and started a similar process with wild cranberries and another with wild grapes. From the jam, or ‘dulce de manzana silvestre” I made, I have used it in a variety of recipes, some of which I will outline here. Substitue for any citrus fruit in baking. Just mix a spoonful with water of the required liquid amount, for cakes etc. Fillings for cookies, cakes or doughnuts. Savoury sauce: The rich apple flavour goes particularly well with pork. After browning the meat, deglaze the pan with stock or wine, add seasonings and a spoonful of crabapple preserve, pour it over the meat. I did it with a pork hock, cooked in a slow cooker, but it would go with chops or roast too. Soup: I added a good dollop to a squash soup. If you have any other ideas to add to these, I would welcome hearing about them. I plan to continue to experiment. Categories: alcoholic beverage, condiment, edible weeds, recipes | Tags: citrus fruit substitute, condiment, crabapples, dulce, flavouring, jam, Ontario recipes, recipes, vodka, wild fruit | Permalink. Since I posted my first recipe for sumac in the early summer, I have had time to figure out other ways in which to use this lemony goodness. 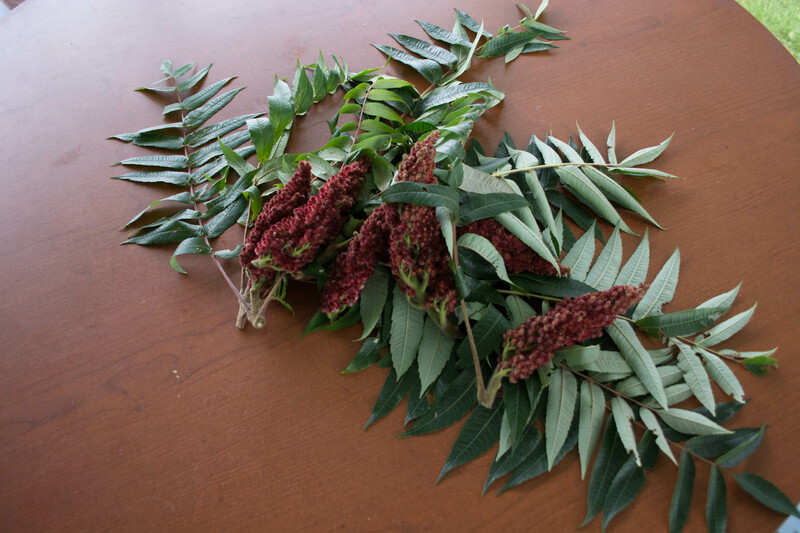 The sumac I refer to is the Staghorn Sumac. 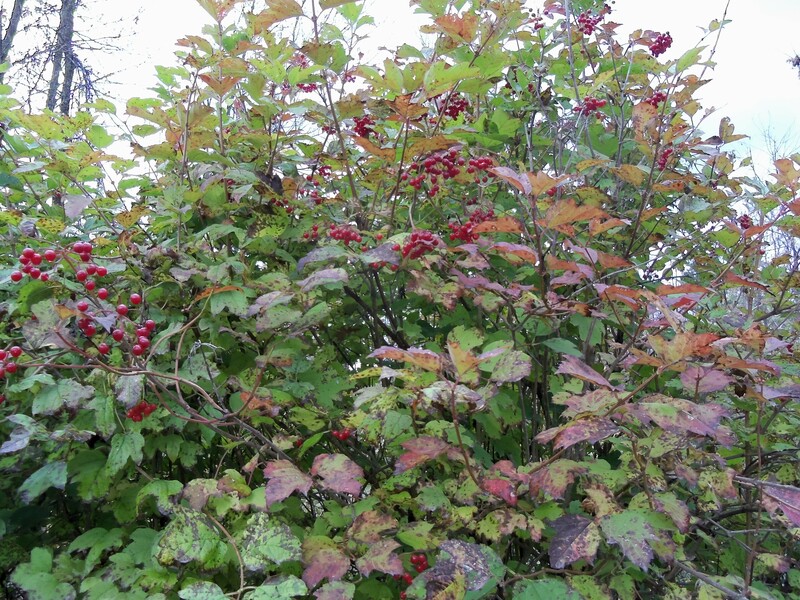 Unlike the sumac with white flowers, it is not poisonous. However, try a little at first, as some people may have allergies to it. 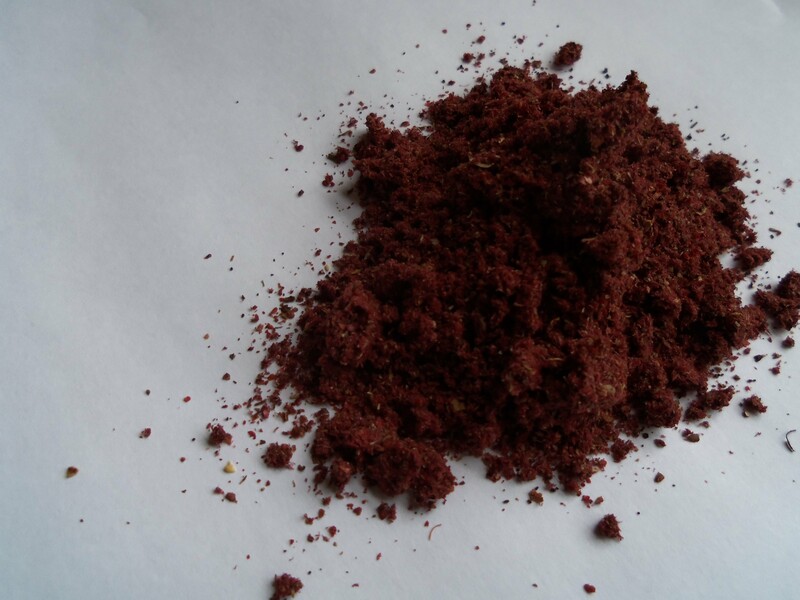 First, I made dried sumac powder. I have been buying this for years from Middle Eastern and Asian shops, and always wondered if I could duplicate it with our own sumac. So that is one puzzle solved. I generally use it in place of lemon in spicy curries, tagine, soups etc, but always parsimoniously because it is hard to find. Now I can use it with abandon. To make the powder, simply pick or scrape off the berries, and place them on a cookie sheet in a 175 F oven until they feel completely dry. This will take probably 4 to 6 hours, depending on how much space they have. I prefer to err on the side of too long, and keep an eye on them. Then put them in a food processor or blender and chop them up as finely as possible, and pass them through a sieve. 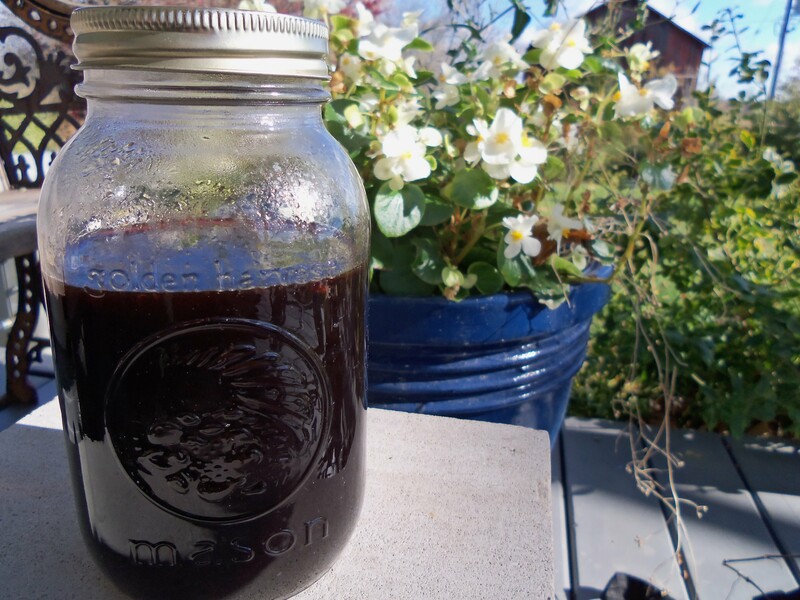 My next project was sumac molasses. Not really molasses, but I wanted to replace my pomegranate molasses with something made from local ingredients. 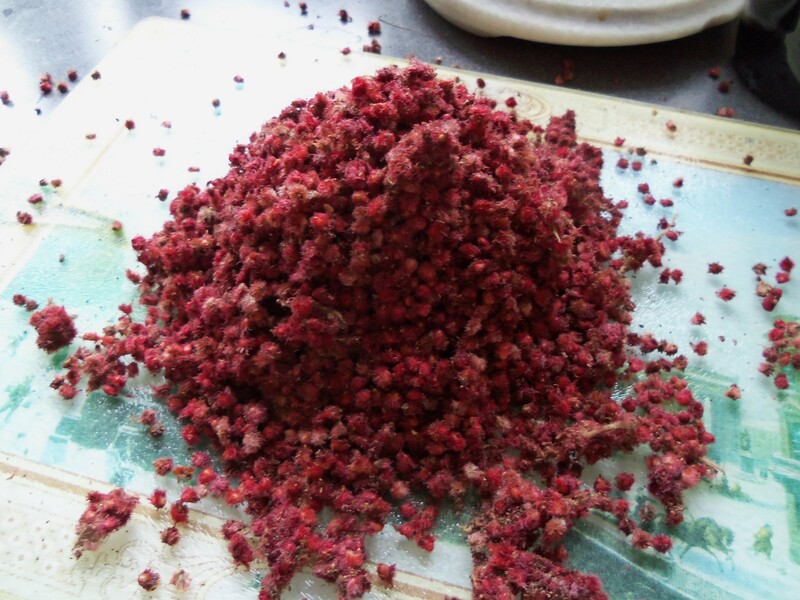 I used 6 cups of firmly packed fresh sumac berries, covered them in water and pressed them tightly down so that I would need the minimum amount of water. I simmered them covered for about half an hour to an hour. I strained off the liquid and added it to 1 cup of brown sugar, then simmered it until all the sugar was dissolved. The purpose for this ‘molasses’ was for use in some Middle Eastern recipes, and in particular a Persian recipe called Fesenjun. I was first introduced to this by my father when he returned from working in Iran, and I later learned to make different versions of it myself. It is simply a sauce made of walnuts and pomegranate juice (or molasses) cooked with duck, chicken, and I believe other meats. I used a whole chicken because that is what I had to work with, but pieces or fillets would work just as well. Just adjust the cooking time accordingly. Brown the chicken on all sides in some oil in a roasting pan. Remove the chicken, pour out any excess oil except a little to which you add the onions. Fry until soft and add the walnuts. Fry for another two minutes. Add the sumac and salt and pepper. Return the chicken to the pot, cover, and place in a preheated oven at 325 F. It took about two hours, and the last half hour I removed the lid. 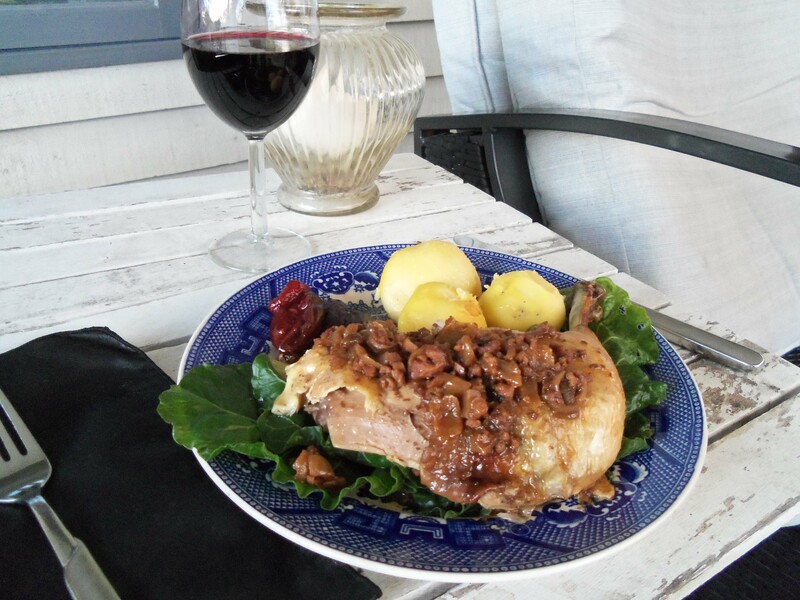 Traditionally this is served with rice, but I had potatoes, pickled plums and mixed steamed greens from the garden. I am pleased to report that the sumac molasses worked very well with this recipe. All the ingredients, except the walnuts, were locally grown, but I hope soon to gather some local black walnuts which will make this a truly Ontario, albeit Persian-inspired, dish. Categories: condiment, edible weeds, main dish, recipes, wild fruit | Tags: chicken, dried sumac, fesenjun, foraging, lemon substitute, locavore, Ontario recipes, Persian cuisine, pomegranate substitute, sumac molasses, sumac recipes, walnuts | Permalink. In the midst of dehydrating jerusalem artichokes, I decided to put a few fresh ones aside to make a soup. I also have an abundance of fennel in the garden, so the two ingredients seemed to make sense. Just remember that if you are not accustomed to eating the artichokes, go easy at first. It is because of the inulin that some people have difficulty with them, but I read that if you cook them at a low temperature, it makes them more digestible. I don’t want to put you off – just want to be cautious. My recipes are usually just a suggestion for how to use the not-so-familiar ingredients. There is no reason you can’t substitute whatever other than the main ingredient. If you don’t have fennel, celery, celeriac, turnip etc. would all work well. Boil the artichokes and potato in the stock until tender. Blend, roughly if you prefer. Fry the onion, garlic and fennel. When they are cooked, but not browned, add the vegetables in their stock along with salt and pepper to taste. Simmer for about 15 minutes. Add the milk and heat through. Just before serving, add the juice. A bouquet of fennel greens, stems and flowers. Put them in a pan with 2 cups of water, bring to a boil and cover, then simmer for about 15 minutes. Strain. Note: I prefer soups not to be over blended, so I blended the potato and artichokes separate. The fennel and onion I just chopped finely enough for soup. If you like a velvety consistency, you can cook and emulsify everything together. 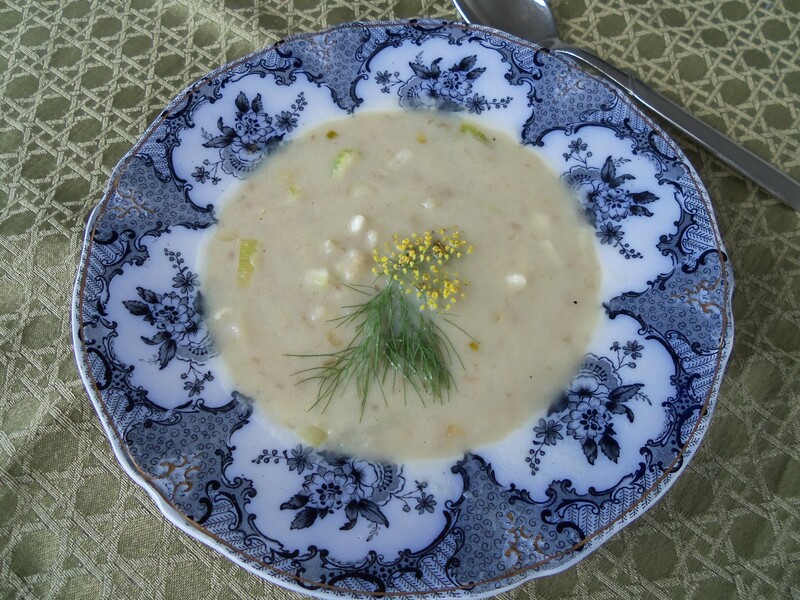 Categories: garden vegetable, recipes, soup | Tags: fennel, fennel bulb, fennel flower, fennel greens, jerusalem artichokes, locavore, recipe, soup, vegan soup recipe | Permalink. After we moved into our current house four years ago, I had to plant some of the basic edibles I had left in our old property – things like horseradish, lovage and jerusalem artichokes. A kind vendor from a market in Toronto gave me a handful of chokes, and from those I now have two good sized patches. As for the lovage and horseradish, I can’t remember where I planted them, and hope they make their presence known to me somehow eventually. The artichokes are more difficult to lose. 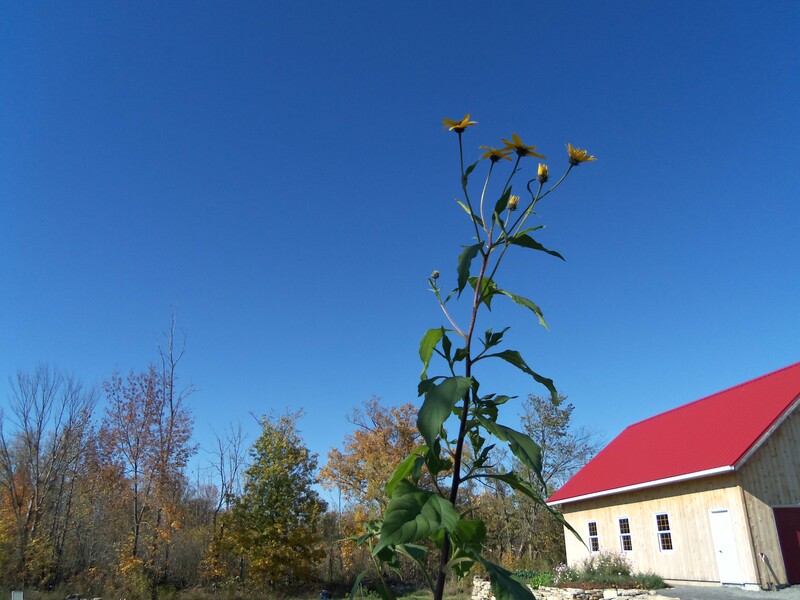 They grow about five feet tall, and as they are of the sunflower family, they have easily recognizable yellow flowers blooming at this time of year. They are also a natural deterrent to weeds, so they don’t get covered or overwhelmed by other invasive plants. Because they multiply so easily, they can be found growing semi-wild. 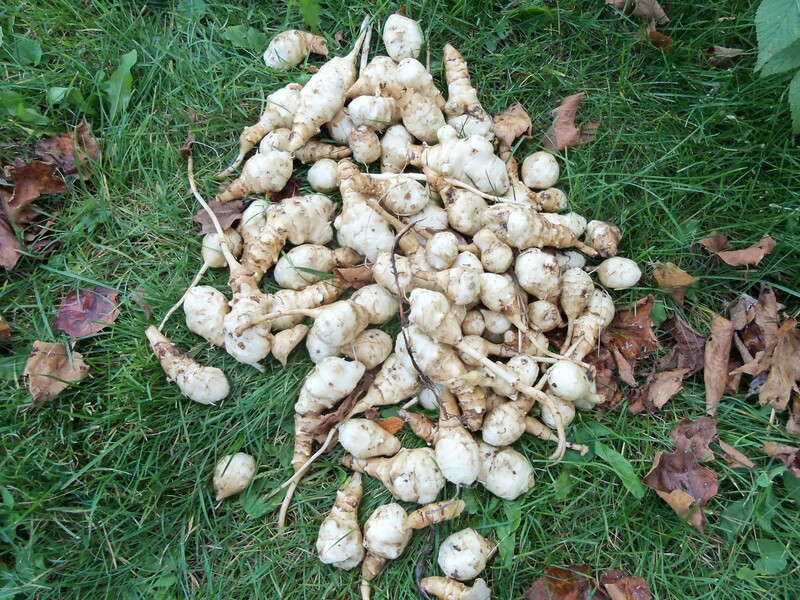 If you suspect you have some, pull out a root, and if there are knobbly white tubers attached to it, that’s it. I love the ease of growing them, as well as their flavour (very much like artichokes). Boiled, roasted, sauteed or grated raw, they are a welcome change from other carbohydrates, especially with a little lemon and salt. However, they are so prolific that you may not be able to use your entire crop. They don’t keep well after picking – two or three weeks in the fridge wrapped in plastic and paper bag over that. Once cooked, they really should be used within a day or two, and don’t bother trying to freeze them – don’t know what it does to them, but it is not pleasant. They do not need peeling, just a good scrub, and any rough spots grated off. Especially if done right away, they clean very easily, and are a nice creamy white. So in order to use as many as I can in the fall and keep them through the winter, I have taken to dehydrating them, then grinding them into a flour. Just how this flour can be used, I have yet to find out over the next few weeks. So far, I have used it as a thickener in soups and sauces, but hope to have some results from my baking experiments soon. In the meantime, I discovered that the thin slices I was preparing to dry (and had way too many to fit into the dehydrator) could also be transformed into crisp, delicious chips. I fried them in coconut oil, a few at a time, and just long enough that they were caramel coloured all over and starting to curl up a bit. I added a little salt, and that was that. Apparently others have done this, but it was new to me! Other recipes suggest other types of oil, which I’m sure are fine, but I am recommending here the coconut. Categories: recipes, snacks | Tags: coconut oil, dried artichokes, jerusalem artichoke flour, jerusalem artichokes, recipes, snacks, storing jerusalem artichokes | Permalink. 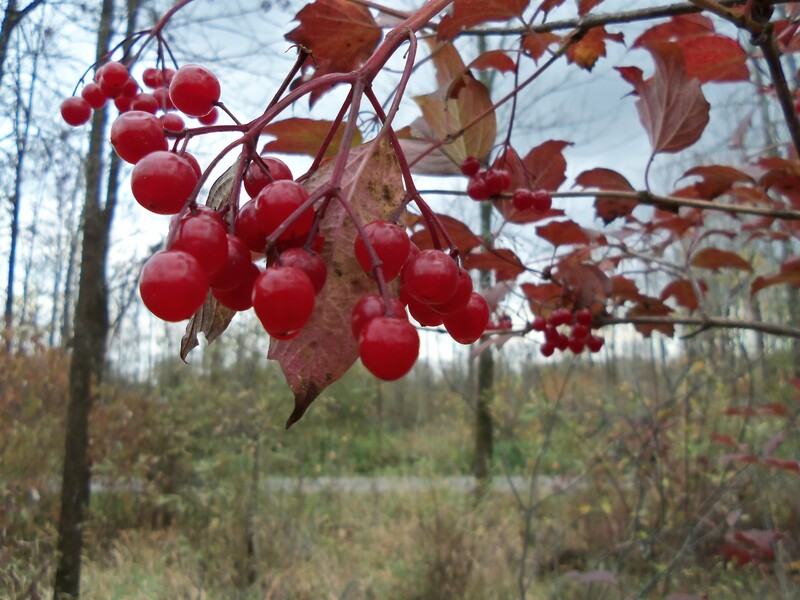 The highbush cranberry (viburnum trilobum) is a fruit I only recently discovered, and happily so. 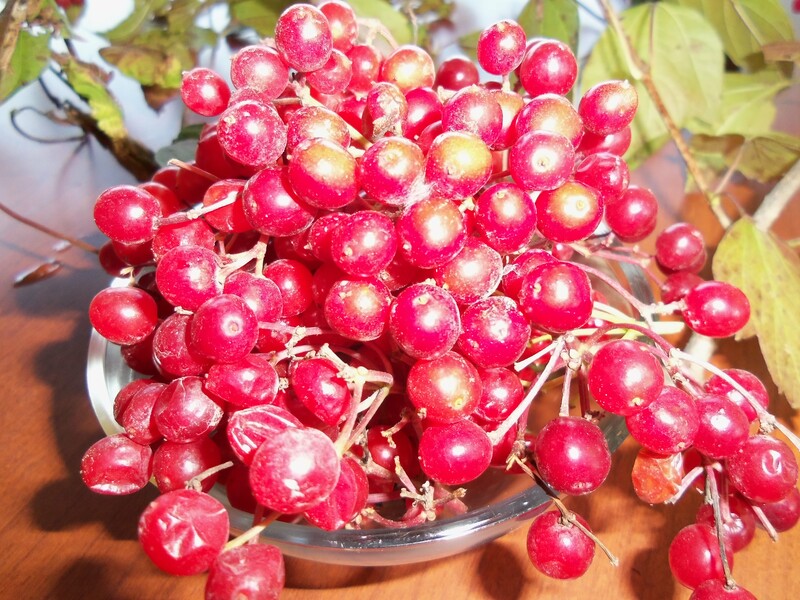 It not only provides beautiful, easy pickable fruit, it is also a good landscaping plant, with white flowers in the spring, and burgundy leaves in the fall. 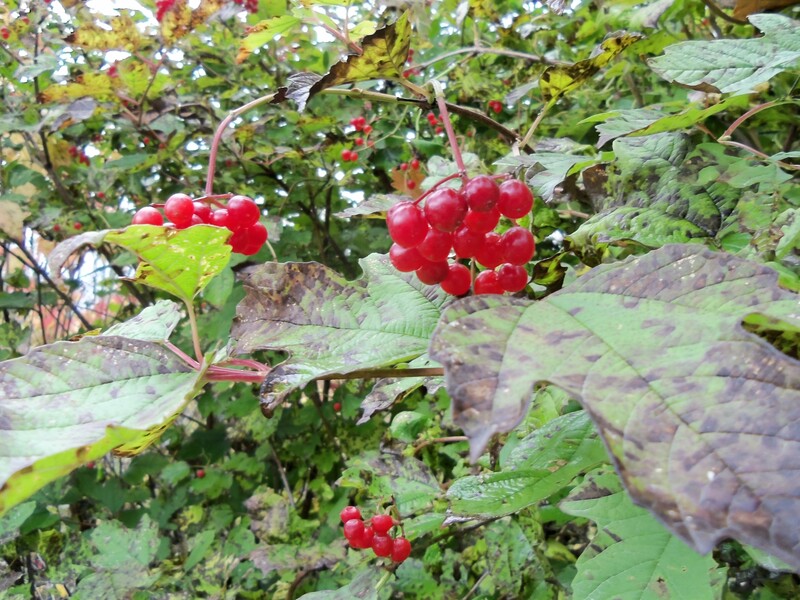 The berries begin as orange and turn to bright translucent red when they are ripe. They are best after frost, and stay on the vine well into winter, unless animals and birds get desperate enough to eat them. Their survival is probably due to their bitter taste. Although they resemble cranberries in colour and flavour, they are actually a member of the honeysuckle family. They can be used much the same as cranberries, and if you like the strong flavour of cranberries, you are likely to appreciate these. There has recently been much written on them on the internet. I will just say that, as with any new plant, you should approach it with some caution, and make sure you don’t have any reaction to it before consuming a large amount. Like cranberries, they make good sauces and jellies, particularly for festive occasions such as Thanksgiving and Christmas. I have so far made three recipes with these, and frozen some for later use. After they are removed from the stems and rinsed, they can be frozen as is. Sprinkle the berries liberally with cane sugar. Place on parchment in a pan and put them in a 200 degree F oven for three to four hours, until they are dry but still soft (like raisins). They are good on their own, or used in baking, with cereal, or wherever you like to use dried fruit. They have one flat, soft, heart-shaped seed in them, but they are chewy and do not interfere with the enjoyment of them. Place berries with roughly an equal weight of white sugar in a non-metal receptacle with a tight fitting lid. Pour vodka over the fruit to cover. Stir it once a day until the sugar dissolves, and allow to age for one month. Strain and bottle. Mix berries in a saucepan with 1/2 the same volume of sugar. I used two cups of berries and 1 cup sugar. Gently heat and stir until the sugar dissolves. Continue cooking until the sauce is a good consistency and the berries are well cooked. They take considerably longer than cranberries. You may add a little citrus zest or any spices you like, but no liquid, as this will only extend the cooking time and result in overcooking of the fruit. Categories: alcoholic beverage, condiment, dessert, recipes, snacks, wild fruit | Tags: Christmas, condiment, dried fruit, foraging, healthy snack, high bush cranberries, liqueur, native Canadian berry, Thanksgiving, Thanksgiving recipes, viburnum trilobum, vodka, wild cranberries, wild edibles | Permalink. With Canadian Thanksgiving soon upon us, here is a recipe which is sure to please those who are not so keen on pumpkin pie, or just want a change, or a dairy-free, gluten-free option. A clafoutis is a classic French dessert, something between a custard and a cake, made with fruit, often cherries. I found this recipe first on a Spanish blog, translated it, and then came across it on another site in English. No idea where it originated, but it is a superb dessert and a great way to show off your perfect little crab apples. I was afraid the apples would not cook well enough, and be hard and bitter, but they were perfect – even better than cherries in my mind. I prepared it in a large pan to give the apples long enough to cook well, but should have used one smaller in diameter which would have made it deeper. Still, it worked well, and was very easy. The mottled effect on mine was the result of sprinkling a mixture of sugar and almond flour before baking it. Perhaps the recipe meant to have it sprinkled on after baking. Here is the recipe as I translated it. For a nine inch cake pan or several small ones. Mix the sweet potato, sugar and eggs. Add coconut milk or cream, vanilla, rice flour, almond flour, salt, ginger and cinnamon and beat together. Refigerate mixture for 30 minutes in the refrigerator. Place the apples in the baking pan and pour the mixture over. Bake at 350 F for 20-30 mintutes, depending on the size of pans you use. Sprinkle the top with a mixture of almond flour and sugar. Categories: dessert, recipes, wild fruit | Tags: clafoutis, crab apples, dairy-free, dessert, gluten free, Thanksgiving dessert, wild fruit | Permalink.